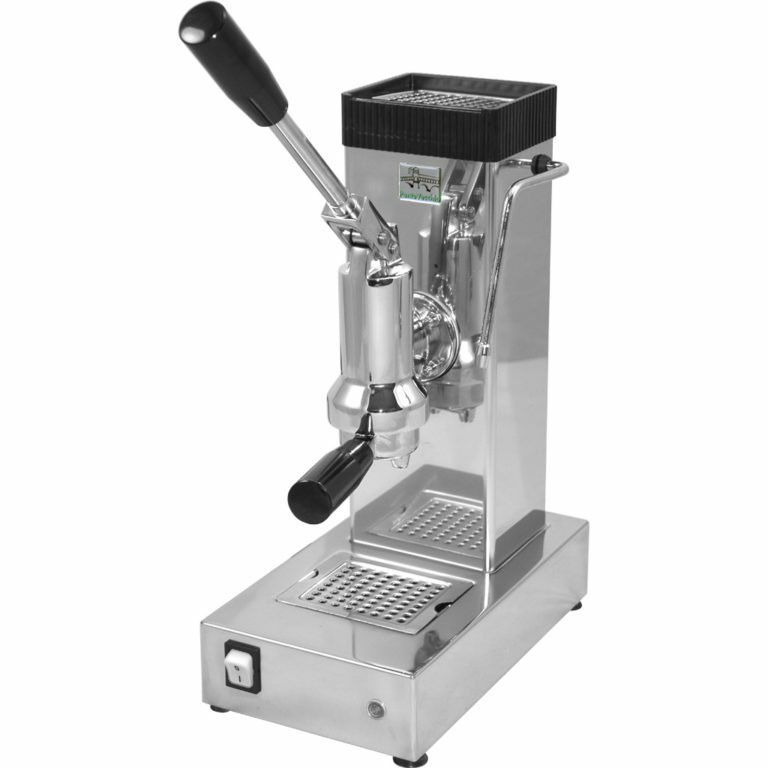 Ponte Vecchio is an Italian company that has been producing lever home espresso machines since 1999. It was founded by a number of entrepreneurs with over 20 years of experience in the industry of mechanical components for small household appliances. Spring piston operated – The lever starts in up position. You then pull down against spring until coffee fills bottom of the your cup. When you release, the lever slowly rises and the piston spring pushes the lever to pump the water through the coffee grinds. If making double, it is important to pull the lever down a second time at the half way point and released. This kind of lever operation is superior to other lever models without it, since the pressure is consistent throughout the extraction. Heating light – The heating light, which is on the bottom front of the machine, indicates when the machine is ready. The light will turn on indicating the water in the boiler is heating up. The light will turn off when the water in the boiler is at optimal temperature. Body – Stainless steel wrap around body. Cup heater – The tray has an angle design, so any cups will not accidentally slide off. Passive heating from the boiler will warm up your cups. 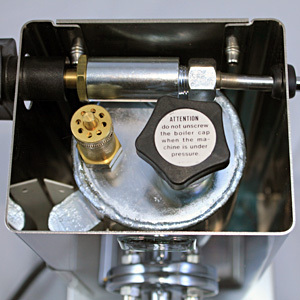 Safety valve – This helps prevent the boiler from overheating. Water level indicator – This gives a visual indication of the water level in the boiler. This also helps when filling the boiler to prevent from over filling. When filling, keep an eye on the indicator. Once it is half full, slowly pour water in a little at a time, until it is about 3/4 full. Fixed position – Doesn’t stick too far out from the machine. This keeps the overall width low. 3 hole – More holes help steam milk faster. Portafilters – Dual spout portafilter. Gold filter head with wood accent handle. 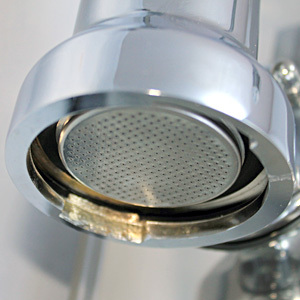 Filter baskets – 1-cup filter basket which holds approximately 7 grams. 2-cup filter basket which holds approximately 11 grams. Pod filter basket which takes standard E.S.E. pods. 45 mm in diameter. Tamper – A cheap plastic tamper. Manufacturers will normally include a tamper like this to keep the overall selling price of the machine low. This tamper is sufficient enough to make a quality shot. Coffee scoop – A simple metal scoop if you are using preground coffee. A nice upgrade from the usual cheap plastic scoops found with other espresso machines. Instruction manual – Simple to read manual written in 5 languages: Italian, English, German, French, Spanish.